Sometimes I learn tidbits of history from the most unexpected places. I listen to a lot of podcasts on a variety of topics, one of which is Lineker & Baker: Behind Closed Doors. It’s generally about English football and broadcasting, but sometimes goes a bit off topic. It’s great fun. In one episode, during a story about a footballer who likes Chupa Chups lollipops, one of them mentioned that the logo for Chula Chups was created by Salvador Dali. Salvador Dalí 1939. 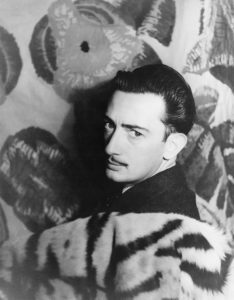 Portrait photographs of celebrities, Carl Van Vechten photograph collection. Library of Congress LOT 12735, no. 275, LC-USZ62-116608 via Wikimedia Commons. 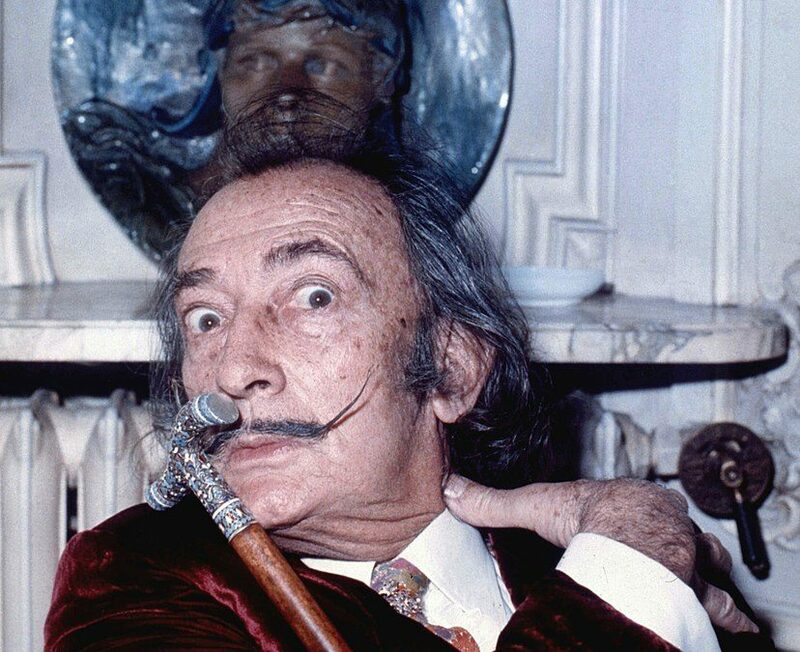 Most of us know Salvador Dali as an artist and flamboyant personality. But while doing a little research, I was struck by the diversity of his work. His most famous painting is The Persistence of Memory, so we tend to associate him with his melting clocks. But he created that in his late 20s and he lived until he was 84, so he had time to do a lot of other stuff. From other research I’ve done, artists tend to pick one lane and stick to it. Dali was different. His art includes paintings, sculpture, a novel, autobiographies, film, photography, jewelry, clothing, and furniture. He even designed retail store windows. And one day in either 1968 or 1969 (I’ve seen both dates used), Dali met his friend Enric Bernat, the owner of Chupa Chups, for coffee. It didn’t take long for Dali to create an image that, with some minor changes, remains in use 50 years later. Chupa Chups sells billions of lollipops every year. This little piece of art is seen billions of times every year. Chupa Chups for White Day. Author: solsolet_bcn via Wikimedia Commons. It’s not just the art, but also the placement. The man who branded himself so well, did one little thing that undoubtedly made all the difference. Dali said to put the logo he created not on the side of the lollipop, but on the top so that it was always fully visible. That’s art, and that’s branding. 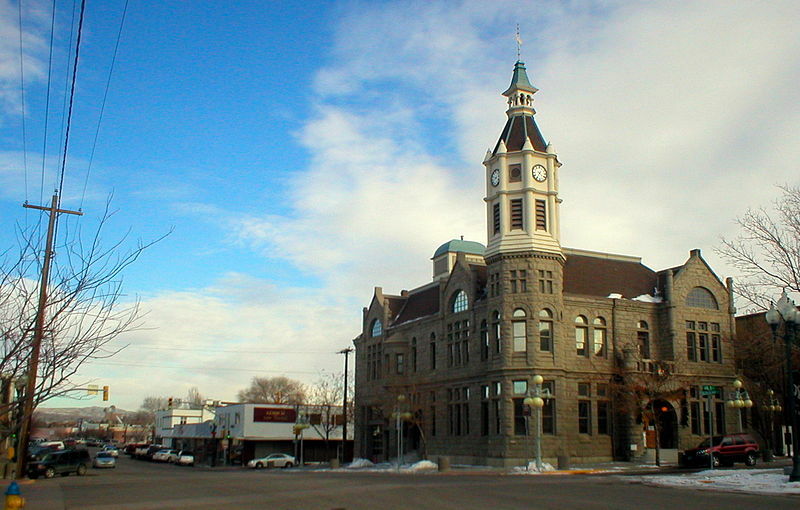 Rock Springs is a small town in southern Wyoming with a population of about 23,000. It was created by the coal industry in the 19th century as coal was needed to fuel the trains. Those coal mines largely employed immigrants. 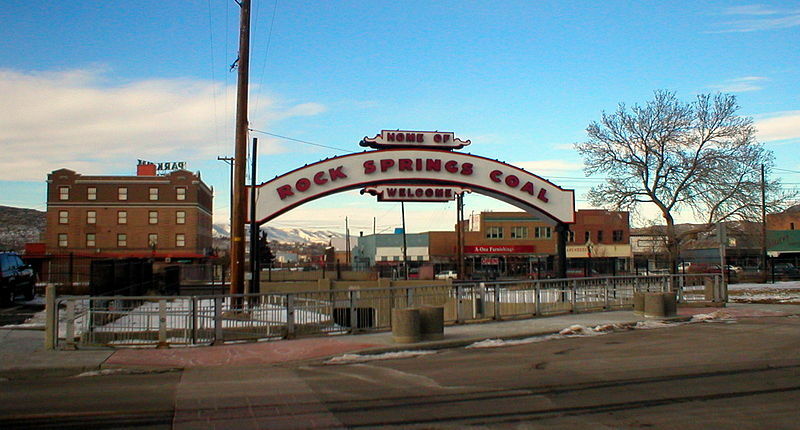 Rock Springs has self-designated as the “Home to 56 Nationalities” due to those immigrants, from Albania to Wales, who came to work in the mines. They have an International Day festival to pay tribute to those immigrants. But those immigrants of 56 nationalities didn’t always party well together. There was a time when, rather than inspiring local pride, this diversity sparked a massacre. 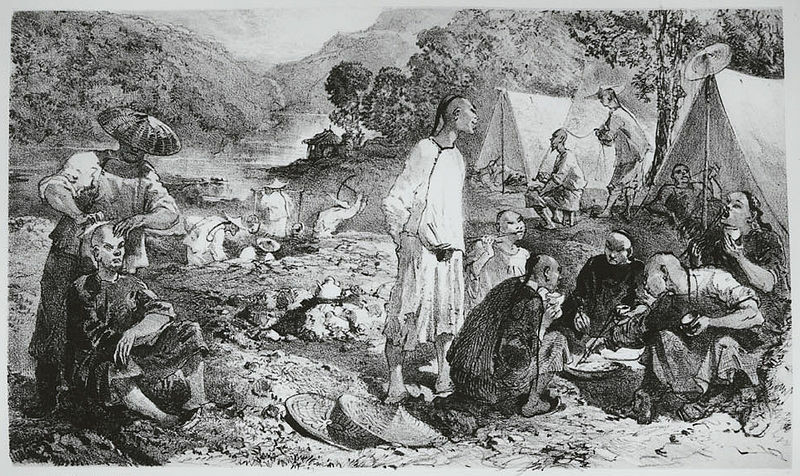 In 1882 the U.S. Congress passed the Chinese Exclusion Act, prohibiting the immigration of all Chinese laborers. This act was supposed to last for 10 years, but wasn’t repealed for 61 years, in 1943, at which time the U.S. allowed 105 Chinese to enter per year. Yes, that is 105. Per year. The Chinese Exclusion Act is an indication of the widespread and socially acceptable racism against the Chinese in America. At the time this act became law, a large number of Chinese immigrants had already been in the country for several decades. They had shown up to take their chances during the gold rush that began in 1848 and stayed to work on building the transcontinental railroad. After that, they found their way to the coal mines in the western U.S, initially acting as strikebreakers in the 1870s. The Union Pacific Coal Department (UPCD) hired Chinese because they were willing to work for less than other laborers. But the white mine workers felt the Chinese were taking jobs away from the white miners and that their employer was using the Chinese to depress wages for everyone, causing economic anxiety. Rather than holding the company responsible for their circumstances, the white miners instead took it out on the most vulnerable of their co-workers. On September 2, 1885, there were 150 white workers and 331 Chinese workers at the UPCD mine in Rock Springs. The Knights of Labor were a group working to unionize mine labor and had a hand in previous strikes. They had also worked for the passage of the Chinese Exclusion Act. They started a chapter in Rock Springs in 1883. The previous strikes had caused aggravation and the loss of money for the mining companies, leading them to increasingly rely on Chinese labor. The horrific details of this story can be found all over the internet if you search “Rock Springs Massacre”. I’ll give you the basics here. 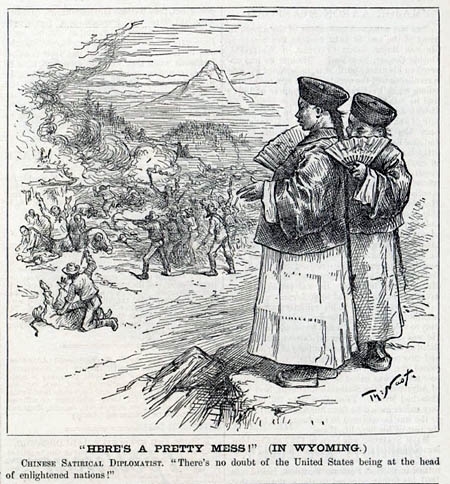 On the morning of September 2, 1885, ten white miners found two Chinese miners working one of the best locations in the mine. Since miners were paid by the ton, location mattered. These white miners felt that they should be the ones to work that location and beat the two Chinese miners badly enough that one later died. This mob told the Chinatown residents that they had one hour to pack up and leave town, but that obviously wasn’t enough to satisfy their anger. 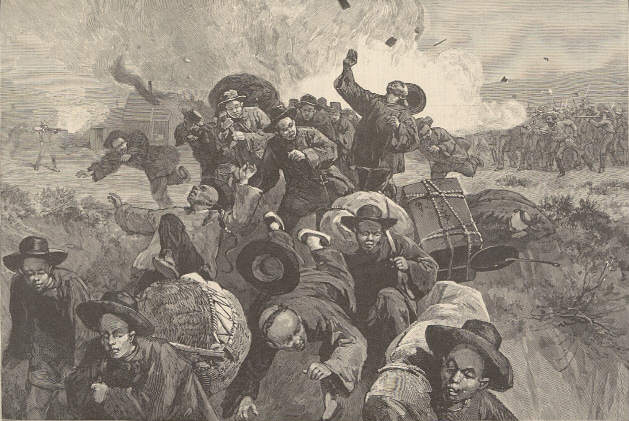 Some of the Chinese were killed as they fled. The Chinese were robbed, scalped, mutilated, branded, decapitated, dismembered, and hanged. That evening the mob set fire to the houses where the Chinese lived, but that were owned by the company. Then they tossed Chinese, living and dead, into those fires. At the end, there were 28 Chinese confirmed dead, although it is estimated the number of dead was closer to 50. Fifteen Chinese were injured. Seventy-eight homes were burned. When UPCD reopened for business, 45 white miners believed to be involved in the violence were fired. 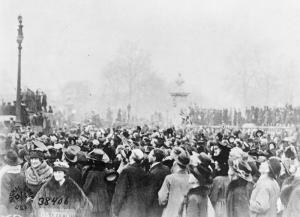 Sixteen men were arrested, although the grand jury refused to indict them and they were applauded when they returned home. I originally posted this story on Veterans Day four years ago. At the time, it was the 100-year anniversary of the year that World War I began, in 1914. This year is the 100-year anniversary of the year that World War I ended, so I want to take this full circle. Also, I have some new readers who may not have seen this the first time around. As a visual person, I still like that this story helps show that 888,246 is not just a really big number, but represents so much more. Tomorrow, November 11, is Veterans Day in the United States, and Remembrance Day or Armistice Day in many other countries. In the United States, this is about all veterans and active duty military, whereas in other countries, it’s a memorial for those military members who died in war. No matter where you are on November 11, thank a veteran or active duty service member for their service. I’m pretty sure they don’t suffer from receiving too much gratitude from those they serve. This observance began after World War I and is held on the day the armistice to end hostilities between the Allied Powers and Germany was signed, at the eleventh hour on the eleventh day of the eleventh month. The First World War, also known as the Great War, has always been my favorite war to study, so be prepared for more future posts on this topic. But for today, I want to talk about a commemoration that is taking place because 2014 is the centenary, or 100th anniversary, of the beginning of World War I. There is a temporary art installation in the moat of the Tower of London that is a visual representation of British and Commonwealth war dead. The poppy has long been the symbol of remembrance for the Great War, and artist Paul Cummins and stage designer Tom Piper have created Blood Swept Land and Seas of Red, placing 888,246 ceramic poppies in the Tower moat, one for each of the dead in a war that lasted a little more than four years. Yes, that number is really 888,246. The ceramic poppies are for sale to the public for £25.00, with a percentage of monies received being split between six service charities. I think this installation is brilliant because that number – 888,246 – is so big that it’s incomprehensible to most of us. Seeing that many bright red ceramic poppies in one place causes us to see each poppy as individual. Each of those poppies represents a person with a life story. Each of those 888,246 had a life before the war, joined the war effort for their own reasons, forged relationships with their fellow soldiers, and had their own opinions about the war and how the war experiences were shaping and revealing the participants. Each of those 888,246 individuals were either young or old, rural or urban, alone or from a large family, married or single, possibly parents. 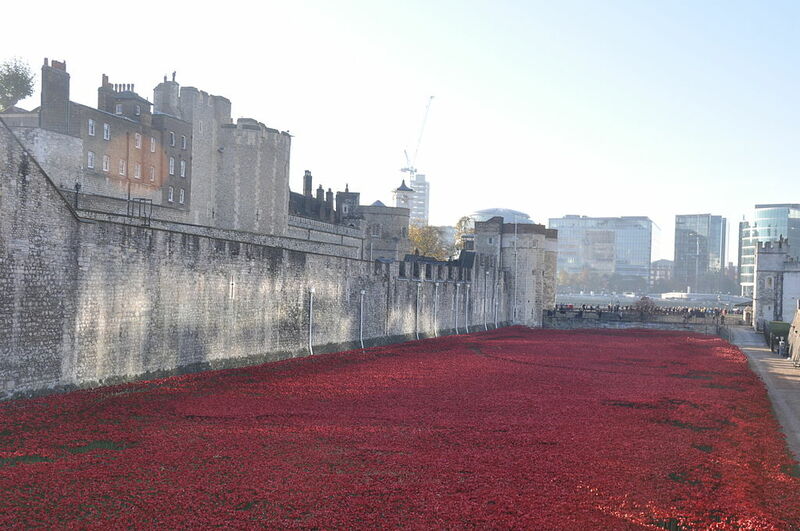 And each of those poppies represents the story of one person’s death. Did that person die instantly or linger in pain? Did they die alone or have someone to hold their hand? Did they have family and friends to mourn them? 888,246 is not just a number. So this Veterans Day, please remember that this “holiday” is not about buying sale furniture. Remember not only these 888,246, but also all of the individuals with life stories from other countries and other wars. That is a number that is truly incomprehensible. I love voting day! Ah, the combination of anticipation and concern. I have been lucky enough to vote in Washington and California. Both have motor voter registration, where you can register to vote when you get your driver’s license. Both have mail-in ballots available so that you don’t have to leave the house if you don’t want to. 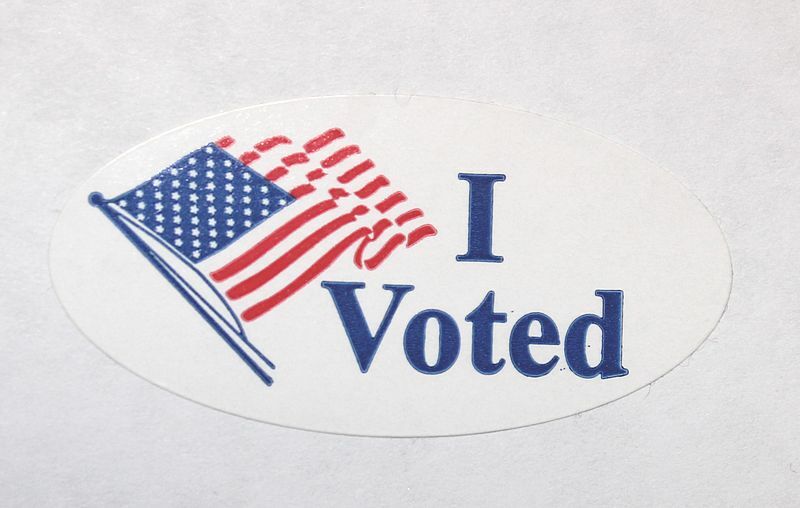 Both have ample polling places so that you don’t have to spend hours in line to do your civic duty. I am aware of how lucky I am to have voting be so easy. It’s not that way for all Americans. Hey, look! No women! 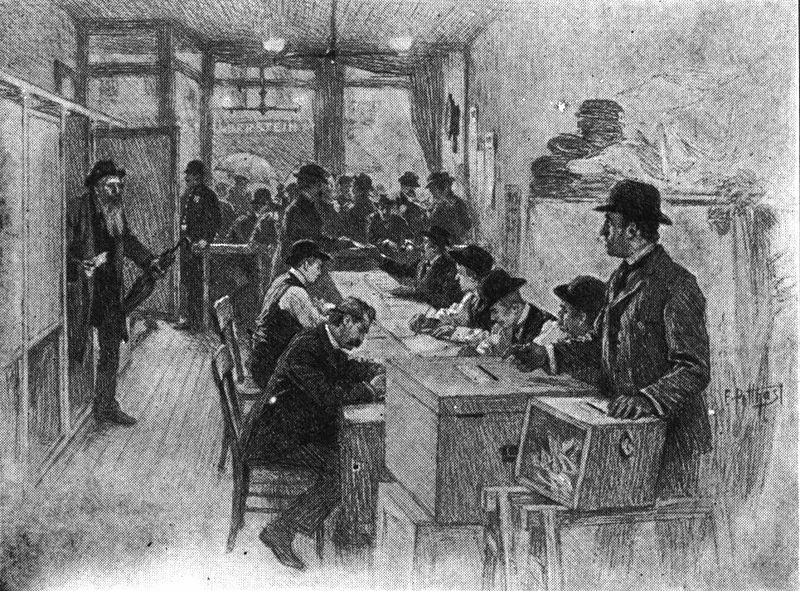 A New York polling place, showing booths on the left. Source: Andrews, E. Benjamin. History of the United States, volume V. Charles Scribner’s Sons, New York. 1912 via Wikimedia Commons. In the last month I have spent several hours researching candidates, judges, ballot measures, and ballot propositions. Because I want to have a say in what happens in my life, whether at the local, state, or federal level. I believe a few hours of time is such an incredibly small price to pay for the impact those informed votes may have on my life. I started taking my daughter to the polls with me when she was just a baby, and we are voting together tonight. One of the best things I have done as a parent is to demonstrate the importance of voting. So, America, this is your chance. Make your voice heard. I voted! Photo by Dwight Burdette via Wikimedia Commons. Wisconsin became the 30th state in 1848, twelve years after the U.S. Congress created the Wisconsin Territory in 1836. On July 23, 1850, an Irish immigrant farmer named John McCaffary, who had arrived from Ireland in 1837, killed his wife, Bridgitt (nee McKean). They had been married less than two years, but according to their Kenosha neighbors, there was much yelling and broken crockery on a regular basis. But one night, Bridgett’s screams were terrified rather than angry. The neighbors were concerned enough to investigate and discovered a wet and muddy John stumbling away from a cistern, where Bridgitt had been drowned in about 20 inches of water. John McCaffary House in Kenosha, WI. 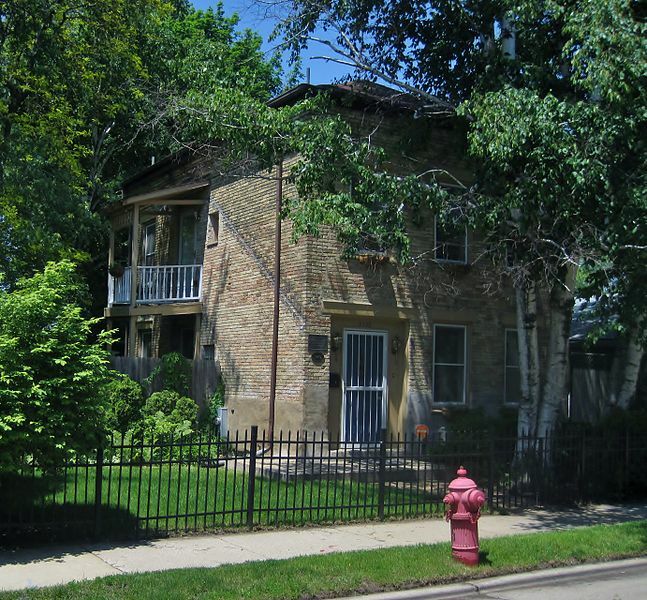 In 1978 this house was added to the National Register of Historic Places. Photo by Teemu08 via Wikimedia Commons. An investigation wasn’t required and John was jailed until his trial in May of 1851. John was found guilty of willful murder. The judge declared that John did not murder his wife in a single passionate act, but that it had taken long enough that John had time to notice Bridgett’s struggles and to reflect upon and cease his actions. John was sentenced to hang. Turns out, this was the first execution since Wisconsin had become a state two years before. On August 21, 1851, a crowd of 2,000-3,000 people gathered to watch John hang. (I’m not going to go into the disturbing historical habit of treating executions as entertainment. Maybe in a future post.) John stood before the crowd and admitted he was the cause of Bridgett’s death and then was hoisted up into the air. As sometimes happens with executions, all did not go as planned. John’s neck was not broken and it took about 18 minutes of struggling for him to strangle to death. 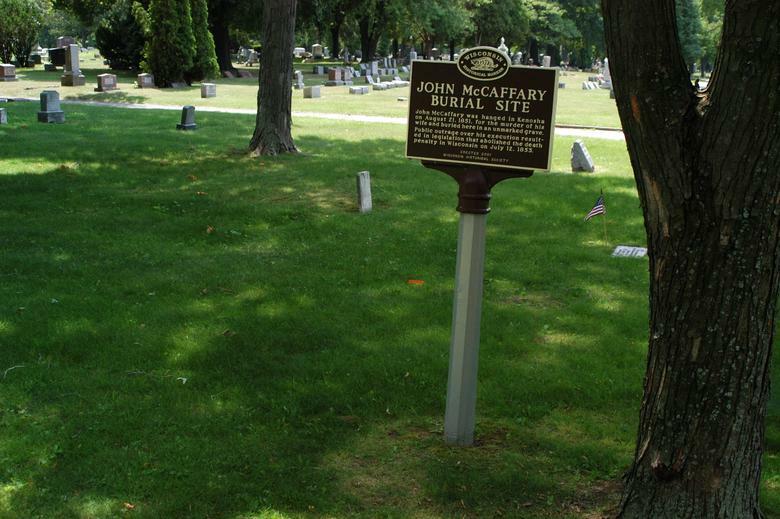 Burial marker of John McCaffary, Green Ridge Cemetery, Kenosha, Wisconsin. He was originally buried in an unmarked grave. Photo by MattHucke via Wikimedia Commons. In part due to the gruesome nature of this particular execution, and in part due to the fact that many people don’t agree with executions in general, a movement was created to abolish the death penalty. In 1853, the Wisconsin state Senate voted for that abolition and the governor signed the bill into law. So John McCaffary is the first, the last, the only person to be executed by the state of Wisconsin. And just so you know, there are 20 states, plus the District of Columbia, that do not have the death penalty. In three other states, the Governor has declared a moratorium on using the death penalty, even though it is still legal. I assume a change in governor could change the rules in those three states. I remember studying some famous historical figures and thinking that they must have had brilliant public relations teams. It wasn’t that they hadn’t done some good things, but that others had done things that were just as good. I don’t have an answer, but consider it one of those weird quirks of history. It’s also fun to learn about someone who appears to be at least a little famous, but is new to me. 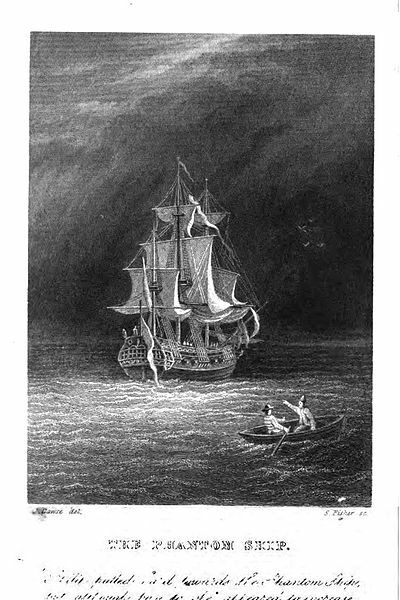 Frontispiece to the novel The Phantom Ship by Frederick Marryat. Published by Richard Bentley, London. 1847 edition. Photo via Wikimedia Commons. Englishman Frederick Marryat (1792-1848) was one of those people that makes me feel like a bit of a slacker. His father was a businessman and member of Parliament, while his American mother was one of the first women allowed membership to the Royal Horticulture Society. Frederick was the second of 15 children. Frederick Marryat. Art: Ernst Hader; Photo: Sophus Williams via Wikimedia Commons. I’m just going to hit the highlights of Marryat’s life, because my brain often thinks in bullet points. He entered the Royal Navy in 1806, at 14 years of age, as a midshipman. He’d already run away from school twice trying to go to sea. For context, this was during the Napoleonic Wars. He took part in military actions and also saved a fellow midshipman who had fallen overboard. Remember, he was still just a teenager at this point. When he was about 17 he contracted malaria and returned to England. After recuperating, he returned to the Mediterranean and saved another shipmate from the sea. In 1811, when he was about 19, he helped save his ship during a storm. Oh yeah, he also saved another shipmate from the sea. He helped capture American ships during the War of 1812. He was promoted to commander in 1815. He was 22. After the war was over, he decided to concentrate on science. He invented a lifeboat and received a gold medal from the Royal Humane Society. 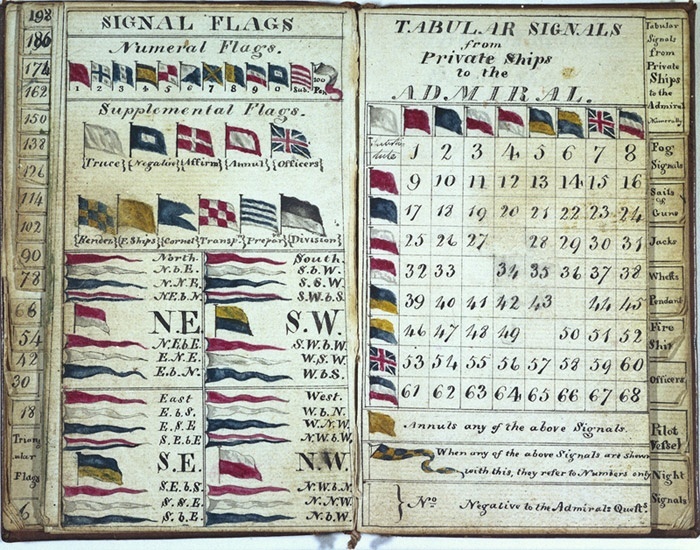 He developed Marryat’s Code, a system of maritime flag signaling. Marryat-Signalcode from the National Maritime Museum. Photo via Wikimedia Commons. He married Catherine in 1819 and they had eleven children. Several of his daughters grew up to be writers. Eight of their eleven children survived infancy. It’s possible that marital problems were one of the reasons he went to North America in 1837 as he drew up a formal separation contract in 1838. 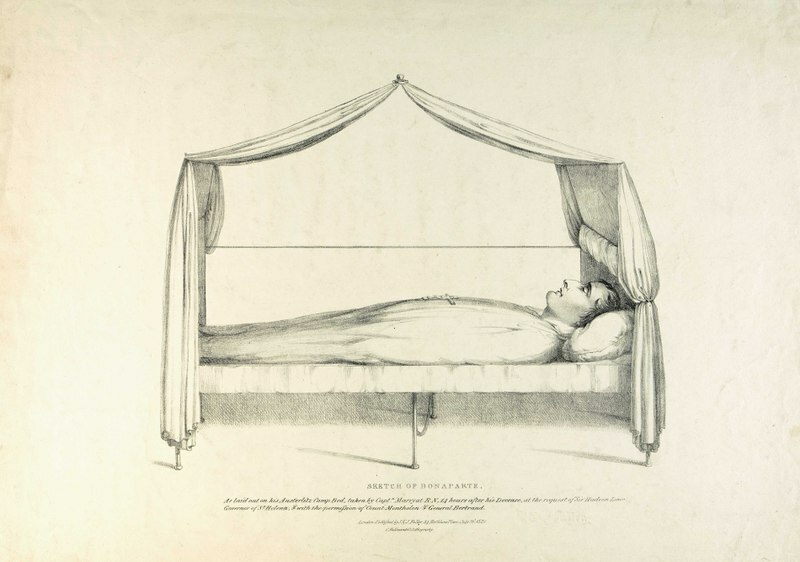 He sailed to St. Helena for the Royal Navy and sketched Napoleon’s body on his deathbed, which was published as a lithograph. ‘Sketch of Bonaparte. As laid on his Austerlitz Camp Bed, taken by Captn Marryat at RN, 14 hours after his decease, at the request of Sir Hudson Lowe, Governor of St Helena, & with permission of Count Montholan & General Bertrand’. Published 16 July 1821.Photo via Wikimedia Commons. In the early 1820s he worked in the English Channel to prevent smuggling. In 1822 he published a work that dealt with the abolition of the impressment of sailors. 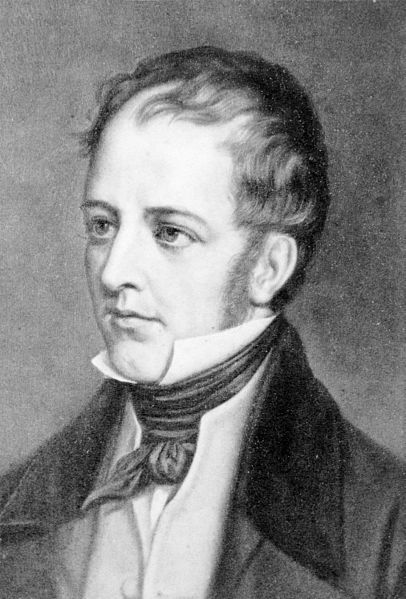 His first novel was published in 1829 and was enough of a success that he resigned his commission in 1830, at the age of 38, in order to devote his time to writing. During the 1830s he wrote and he traveled, to Europe and to North America. He happened to be there in 1837, just in time to help the British forces stop a rebellion in Canada. One of the reasons he was there was to protect the copyright on his books because of the widespread availability of pirated copies. In 1839 Marryat’s Diary in America was published, in which he wrote much about his time in Canada and criticized American culture and society. 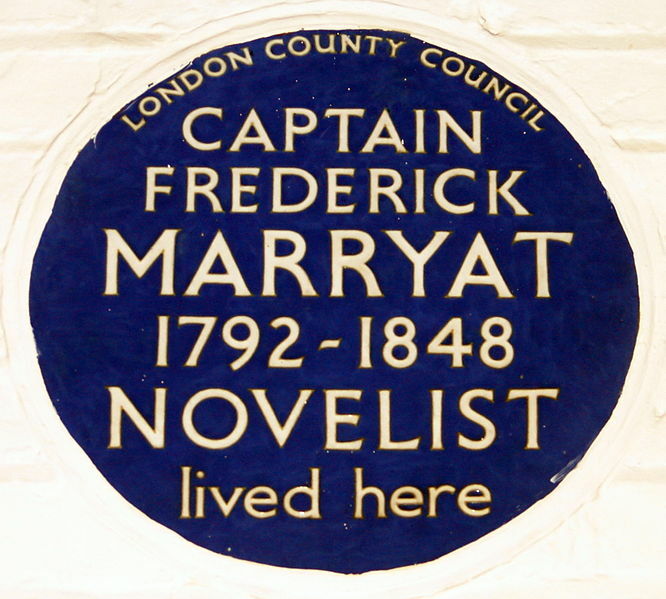 Marryat is best known for writing nautical stories, drawing on his years of experience at sea. Author: Simon Harriyott from Uckfield, England. Photo via Wikimedia Commons. One of the most frustrating things about living through current events is that we don’t yet know the final results. Our knowledge builds over time until eventually, sometimes, the whole story is known. But I’m always interested in what people knew at the beginning of historical “current events”. So I check out old newspapers. The island and volcano of Krakatoa, Strait of Sunda, submerged during the late eruption Abstract/medium: 1 print : wood engraving. Photo via Wikimedia Commons and the Library of Congress. Like this story. What we know now, 135 years after the fact, is that in August of 1883 a volcano erupted at Krakatoa over the course of two days, the 26th and 27th. Tens of thousands of people died immediately, some from the heat, ash, and gasses, but most from the tsunamis generated by the blast. Eventually the Dutch authorities estimated the death toll at 36,417. 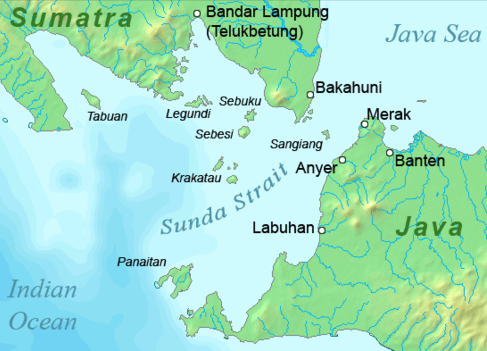 Map of the Sunda Strait, Indonesia via Wikimedia Commons. Multiple eruptions destroyed or collapsed 70% of the island of Krakatoa. The sound of the loudest of the explosions, the big one on the second day, was heard more than 2,000 miles away. Scientists estimate the eruption was about 10 times more explosive than Mount St. Helens in 1980. Around the world, the particles blown into the atmosphere by the volcano caused red sunsets and sometimes made the moon look blue or green. Global temperatures fell and weird weather continued until 1888. But they didn’t know all of that in August of 1883. You, like me, might be surprised by what they did know. You see, in 1883 there were already undersea telegraph lines so that news and information could travel quickly around the world. It wasn’t 24-hour cable news, but it was much faster than sending messages by ship. On August 28, 1883 The Sun in New York reported news from Batavia, which is now Jakarta. 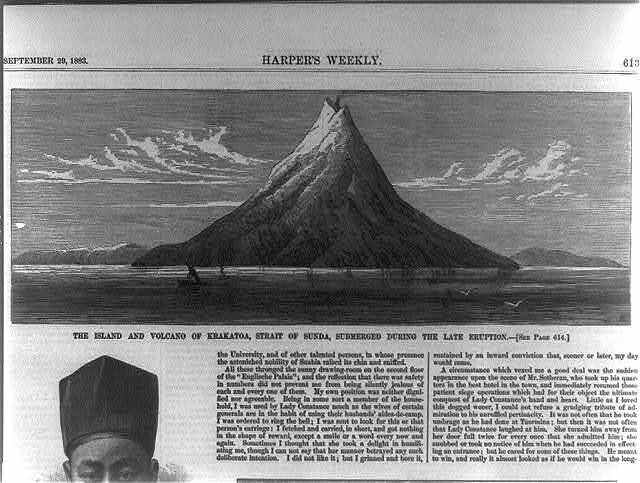 Batavia, Aug. 27.-Terrific detonations were heard yesterday evening from the volcanic island of Krakatoa. They were audible at Soerakrata, on the island of Java. The ashes from the volcano fell as far as Cheribon, and the flashes proceeding from it were visible in Batavia. Stones fell in a shower on Serang, which was in total darkness throughout the night. Batavia was nearly so, all the gaslights having been extinguished during the night. Communication with Anjier is stopped, and it is feared that there has been a calamity there. Several bridges between Anjier and Serang have been destroyed, and a village has been washed away, the rivers having overflowed their banks because of the rush of the sea inland. Krakatoa is a little island in the Strait of Sunda, which divides Java from Sumatra. Krakatoa is about seven miles long and four miles broad. Batavia is the principal port and city in Java, which is itself of volcanic origin, contains several volcanoes, and has frequently suffered from earthquakes and volcanic eruptions. Cheribon, a place of 11,000 population, is on the north coast of Java, 125 miles E.S.E. of Batavia. It contains the residence of a Dutch Governor, and is a conspicuous market in the coffee and indigo trades. Anjier is a little seaport of Java on the Strait of Sunda. This was just the beginning, before Krakatoa completely blew her top. So readers knew what was happening, but had no idea yet about how bad it would be. Maybe they even thought it was over. The report that showed up in The Breckenridge news out of Kentucky the next day, on August 29, 1883, was detailed and brutal. The entire article is too long to include here, but I’ll give you some highlights. London, Aug. 28. – Saturday night, the 25th ult., and next morning, volcanic disturbances began and continued on the island of Krakatoa, in the strait of Sunda, fifteen miles off the coast of Java. …Little alarm was felt at first, but within a few hours showers of stones began to fall at Jogjakerta, Sourabaya, and Samarang. All through the night showers of red hot rocks and ashes fell, making complete darkness in all these towns. In Batavia there was an occasional fall, and it was difficult to keep the street lights burning in the European quarter. By the next morning all communication with Anjer was cut off, all the bridges having been destroyed by the descending rocks and ashes and the road rendered impassable. On Sunday morning the disturbances had extended beneath the waters of the strait, and they were soon boiling and hissing violently, while great waves dashed upon the Javanese shores, and the temperature of the sea went up nearly twenty degrees. …The peak of Gunung Tengger is 6,000 feet above the sea, and the monument of flame on top of this made a scene of wonderful grandeur. Every moment a huge boulder at a red or white heat would be hurled from Tengger’s crater with terrific force, and, after going hundreds of feet into the air, would fall back with a whirr, crashing through the thatched roof of some Chinese fisherman’s hut, or crushing beneath its huge mass the body of some native peasant. …Much of the northern portion of the island, which was covered with tracts of forests, was soon in one great blaze. The red-hot vomitings from the craters had set the trees on fire, and the giants of the woods fell one after another, like so many sheaves of wheat before a gale. As the eruptions increased in frequency and violence the disturbance of the waters surrounding the barren coast became more and more violent. The waves came whelming over a marshy plain along the shore, suddenly engulfing a hamlet of fishermen’s rude houses, and, turning suddenly back, swept away almost every vestige of what a moment before had been a scene of bustling activity. What a few hours before were fertile valleys, covered with flourishing plantations of coffee, rice, sugar, indigo or tobacco, the staples of the island, were now but mud, stone, and lave-covered fields of destruction and ruin. Probably not a single crop in Java will be saved. On the same page of the newspaper they continued with new reporting. London, Aug. 29.-Further particulars of the great volcanic eruption in Java show that the disaster was even more widespread and more disastrous than reported in yesterday’s advices. At noon Sunday the eruptions and shocks were supposed to have reached their height, but late in the afternoon and evening the violence of the disturbances suddenly increased, and the island seemed to be about to be completely buried in fire and surphurous ashes. At the same time the enormous waves began to dash with greater force upon the shores, coming in some places far up into the interior, and the great chasms opened in the earth and threatened to engulf a large proportion of the people and buildings. About midnight the most frightful scene of all took place. Suddenly an enormous luminous cloud, similar to that which was seen over the Gunung Guntur, but much greater in extent, formed over the Kandang range of mountains which skirt the southeast coast of the island. This cloud gradually increased in size, until it formed a canopy of lurid red and whitish gray over a wide extent of territory. …The aggregate loss of life must be fully 75,000, but the number of those who perished can never of course be accurately known. If you’ve read this far, or actually linked in to the original article, you may have noticed the prose used. Not only was it a different time in terms of language, but remember that they didn’t have television. Imagine if you had never seen a volcanic eruption. The words had to tell the story. If you want to check out some old newspapers, for gossip, old advertisements, or the use of language, I recommend Chronicling America from the Library of Congress. 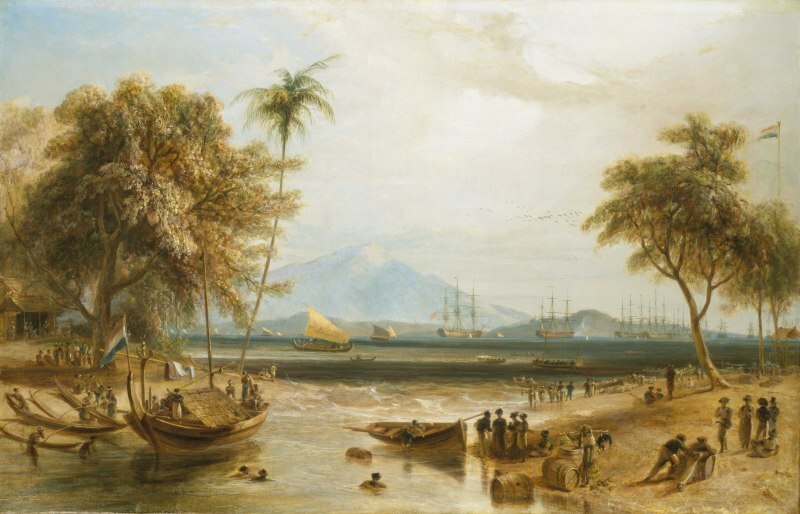 The Watering Place at Anjer Point in the Island of Java by William Daneill (1769-1837). Painting shows Anjer Point in 1793, 90 years before Krakatoa destroyed it. Photo via Wikimedia Commons. If you pay much attention to U.S. politics, you have probably heard that some aspects of our current situation can be compared to the Gilded Age in the late 19th century. The most commonly noted similarities are social problems and increasing wealth disparity. Of course, those two issues are generally related. The end of the Gilded Age was concurrent with the beginning of the Progressive Era. This started about 1890 and continued a couple of decades into the 20th century. The Progressive Era was defined as a period of social activism and reform, attempting to solve the problems created by the Gilded Age. 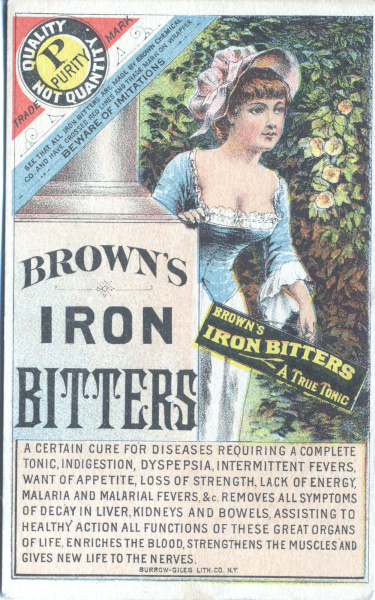 I was researching advertising, traveling medicine shows and the patent medicines of the late 19th century when I was reminded, again, how seemingly disparate things can be connected. Plenty of movies and TV shows about the U.S. during that period include scenes with traveling medicine shows. Wagons filled with bottles of tonics arrive in small towns or rural areas and the conman in charge gathers a crowd. Whether you wanted or needed (or could afford) help with any of your aches and pains, at least you would be entertained. And as has always been the case with conmen, they knew what the people wanted to hear and to believe. These traveling medicine shows were one form of advertising for the various “medications” available. Advertisements for tonics of all types were a huge source of income for newspapers and magazines. It may have been a different time, but they also knew the value of branding, Their names were as well-known to their customers as the name of your favorite restaurant or car. But there was a problem. Those bottles of tonics didn’t have a list of ingredients, and not just because the manufacturers were protecting their super secret recipe. Some of the ingredients were toxic and/or addictive. Consider that oft-repeated story about a certain brand of soda actually including cocaine. Enter the free press. The reform-minded journalists of the Progressive Era were known as muckrakers, and they were investigating many of the social ills of the time. They would disguise themselves and go undercover, infiltrating asylums and big business, or anywhere else they felt the truth could be discovered and shared. Those investigative journals drove positive reform in many ways. One of the many investigations was into deaths that were linked with various tonics. In 1905, Collier’s magazine published the expose shown in the photo below. 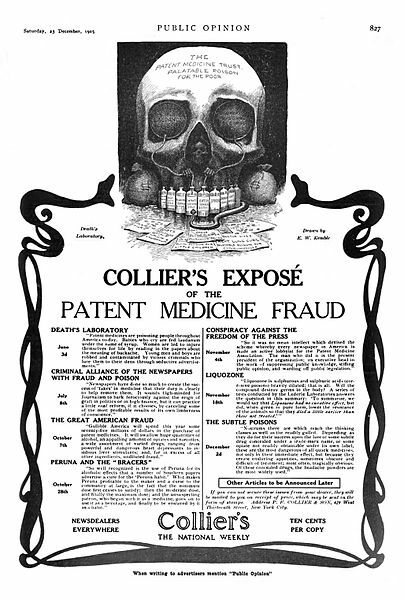 The Collier’s article alerted the public to the dangers of their medications, but didn’t stop the manufacturers from creating and selling those tonics. Enter the 59th United States Congress. They passed, and President Theodore Roosevelt signed, the Pure Food and Drug Act of 1906. This didn’t solve everything, but was a solid beginning. It was mostly about blocking adulterated and mislabeled foods and drugs and was limited to interstate commerce. The products were subject to inspection, but the fines levied on businesses were small. However, all the products that did not pass inspection were subject to seizure and destruction, and that cost a lot more than the fines. Also, although the convictions didn’t necessarily cost the businesses much in fines, all those convictions were published. Consumers may not have all seen the original article, but they probably saw at least one of the convictions published. 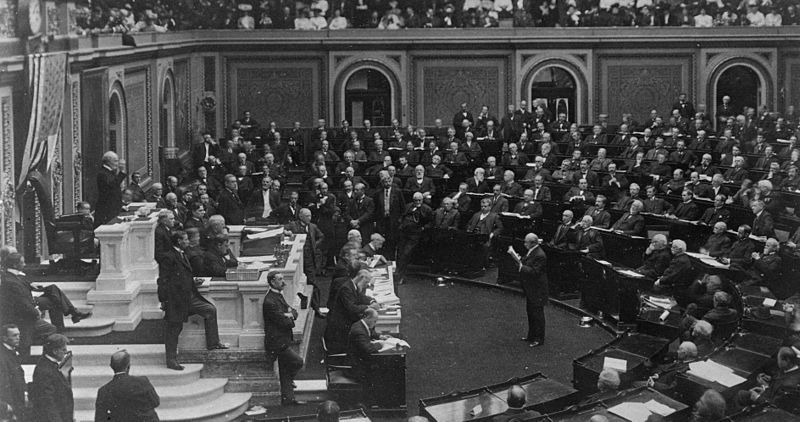 Opening ceremonies of the 59th United States Congress, 2nd session, 1906, with Speaker Joseph Cannon presiding. Photo via Wikimedia Commons. This image is available from the United States Library of Congress’s Prints and Photographs division under the digital ID cph.3c21291. The Progressive Era. Consumers are put in danger by a product sold to them by businesses aware of the danger. The free press steps up to expose the dangers and the businesses. Congress steps up to protect consumers by placing regulations on the manufacture and sale of the product. Easy peasy. Sometimes I start to research a topic and decide, for a variety of reasons, not to do a full post. But some of those bits are still interesting, so I’ll share some of them with you. A hat trick is a term used in sports to signify the completion of three scores in a game. I watch soccer and a hat trick is three goals by the same player in one match. Three goals in hockey by the same player in one game, also a hat trick. The term was first used in 1858 in regards to a cricket match. A player took three wickets with three consecutive deliveries. Yeah, I don’t know what that means, either. But it was special enough that the fans took up a collection to celebrate this great thing and great player and used the proceeds to buy the player a hat. Hat trick. 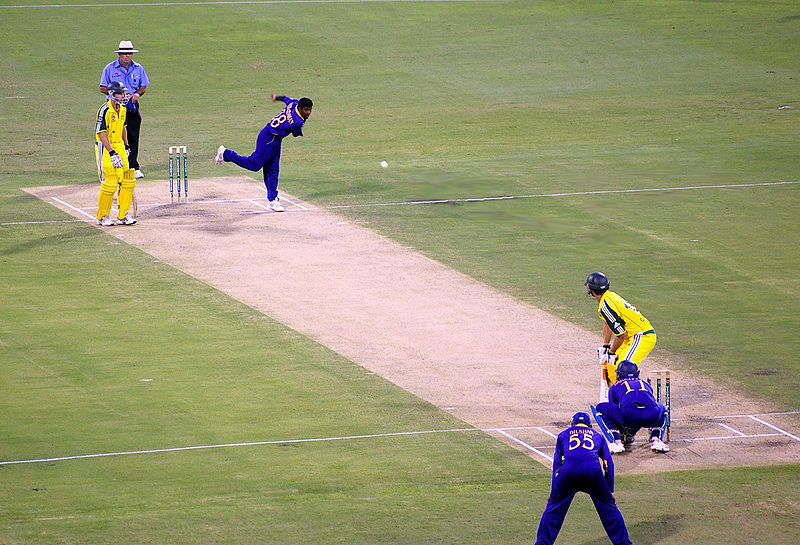 Muttiah Muralitharan bowls to Adam Gilchrist in a one-day international at Brisbane. Gilchrist went on to hit a centruy off 67 balls. Muralitharan finally bowled him for 122. (Yeah, I still don’t get it.) Photo via Wikimedia Commons. Construction on the cathedral Notre Dame in Paris began in 1163. 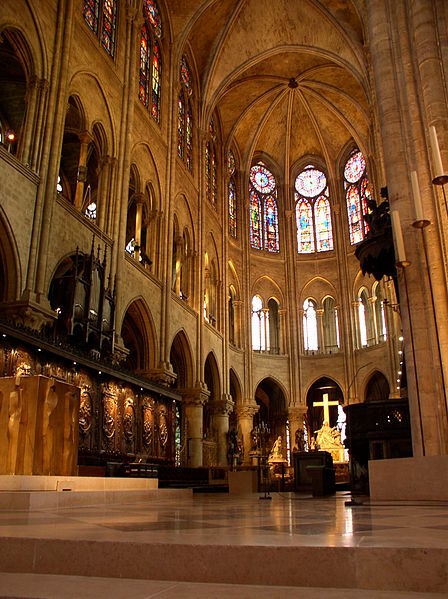 Six centuries later, in 1793, while the French Revolution was reaching for liberty, equality and fraternity, Notre Dame was rededicated to the Cult of Reason (state-sponsored atheism). Many of the statues within were destroyed, and this beautiful church was used as a warehouse to store food and grain. Restoration didn’t begin until 1845, and now Notre Dame is visited by about 13 million people per year. Since the late 1940s, carbon dating has been used to date things, like human bones, that contain organic material. Used on bones, this can affect the historical interpretation of archaeological finds. A burial ground was found in England in 1982. 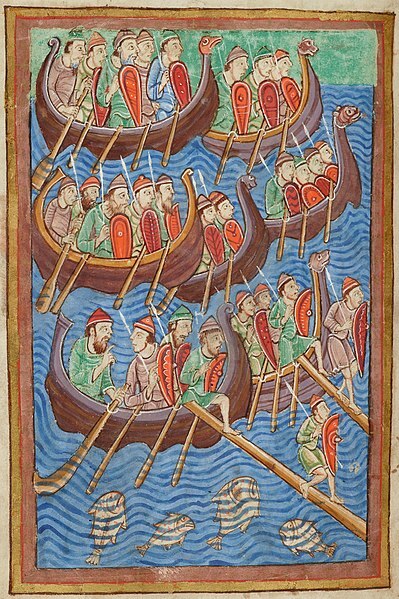 Archaeologists hoped these were the remains of the Great Viking Army from the 9th century, the time of Alfred the Great. But the carbon dating showed the bones to be from the 7th and 8th centuries. Turns out, carbon dating is skewed if the organic material in question ate a diet of mostly seafood rather than land-based food. Vikings spent a lot of time on the coast and in ship and had a diet that was largely seafood. It is now believed that these remains really are from the Great Viking Army. With new data, you need new interpretations. In Portugal, sometimes the art is underfoot. 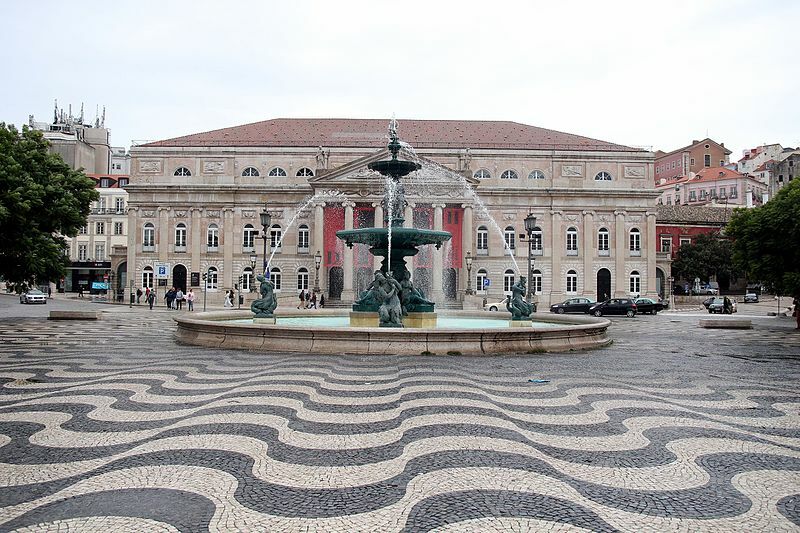 Since the middle of the 19th century, many public spaces in Portugal have been paved with calcada Portuguesa, or Portuguese pavement. Skilled artisans use cobblestones to create mosaics. I’m all for being surrounded by beauty, but there are some issues with the beautiful pavements. There are no longer many artisans skilled enough to complete necessary maintenance and repairs. As the cobblestones get worn, they become slippery. You most definitely don’t want to wander these paths wearing stiletto heels. Now there is talk about replacing these pavements with more modern pathways. I get the practical aspects, I really do. But if the decision were mine to make, I would choose beauty. Today’s post is a special request from my dad, Jim Hanson. He was watching Jay Leno’s Garage and saw a segment about the train that takes visitors to the top of Mount Washington in New Hampshire. My dad’s last base before he retired from the U.S. Air Force, my senior year in high school, was the now defunct Pease Air Force Base in New Hampshire. One of the best things about growing up in the military, and with my parents, was that they always wanted to explore all the new places the Air Force sent us. So while in New Hampshire, of course we checked out the tallest mountain (6,288 feet) in the state. Mount Washington is known for it’s unpredictable weather, and the day we were there it was crazy windy. Like blow-away-a-small-child windy. But even that was not as bad as the record on April 19, 1934. On that day, the Mount Washington Observatory recorded wind speed at 231 miles per hour. That’s still a record for wind that’s not part of a hurricane or typhoon. Born on a farm in New Hampshire, Marsh made his fortune in Chicago in the meat packing business. 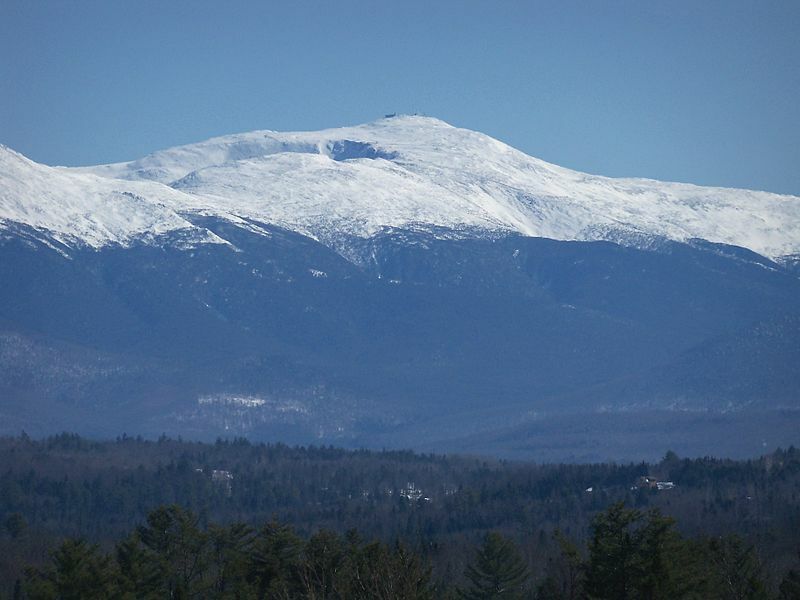 He returned to New Hampshire and according to his great-grandson, in 1857 Marsh climbed to the top of Mount Washington. Inspired by all he saw, he wanted to make that view available to all. He decided a train was the best way to enable more people to reach the summit, but the grades were too steep for the standard friction-based rail. 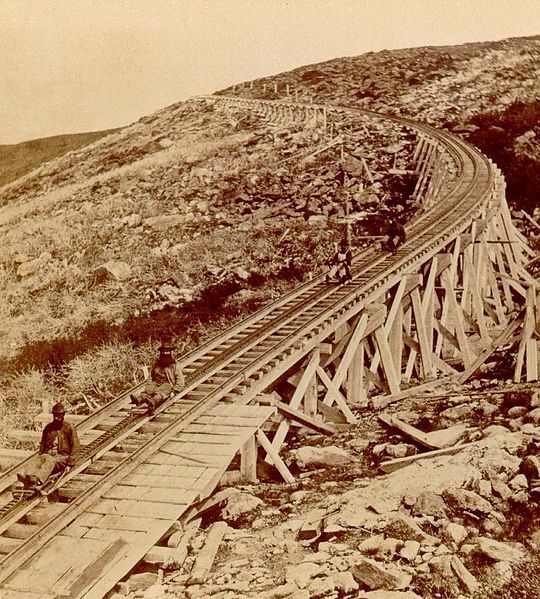 So he devised a new system, using cogs (see photo below) between the rails that would keep the train on the tracks even on the steepest sections of the mountain. 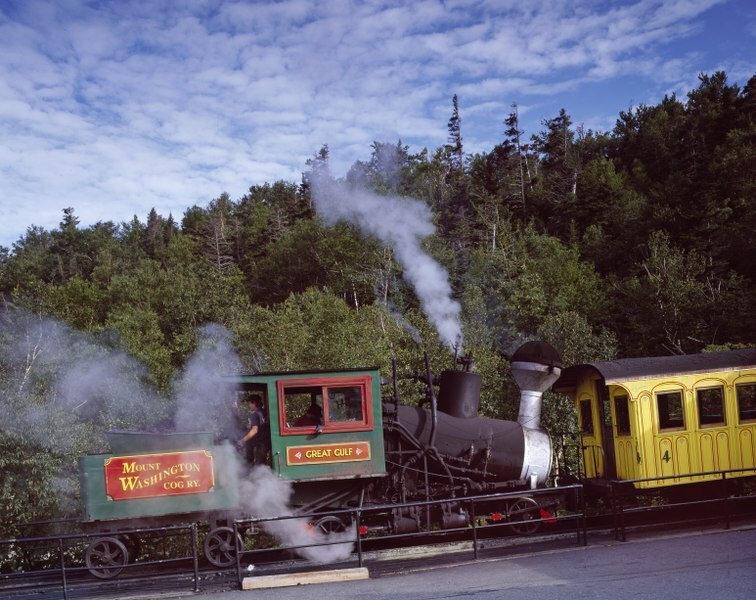 The partially completed railway first took paying customers on August 14, 1868 and the tracks to the top were completed in 1869, making this the first mountain cog railway in the world. The track is 3 miles long. It takes about an hour to travel those 3 miles, but the views must be amazing. As of today, the cost of an adult ticket on the steam train (they now also have biodiesel trains) is $78. As you can see in the above photo of the train, the boiler has to be tilted at a weird angle so that it sits level on the steep grades. Apparently the boiler would be destroyed if it wasn’t designed this way. Another environmentalist nightmare is that each trip also uses, along with all that coal, 1,000 gallons of water. The train actually pushes the passenger section up the mountain, rather than pulling it. If that wasn’t enough American ingenuity for you, below is my favorite photo. The men building the tracks created sleds that worked on the cogs to slide down the tracks at the end of the work day, rather than walking down the mountain. 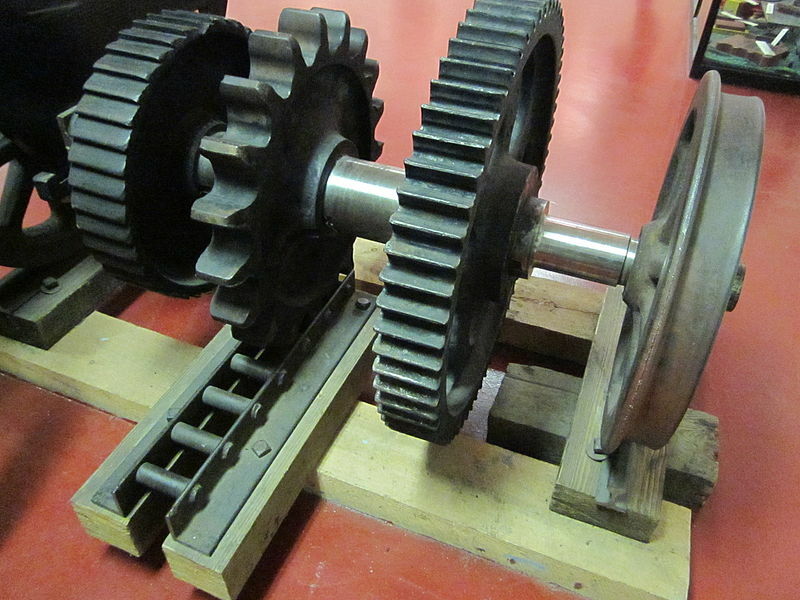 Cogs are useful and fun!